Salad bars provide a delicious way to get plenty of vitamins and minerals into your daily diet. What happens, however, when you feel like you’ve had every salad there is to try and you just can’t get excited about making or ordering one more salad? 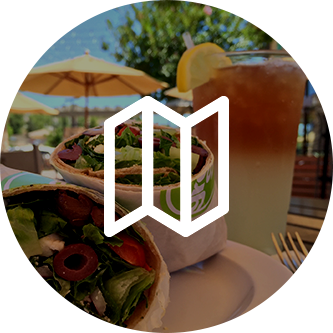 At Greenspot Salad Company in San Diego, we have the perfect solution for you! 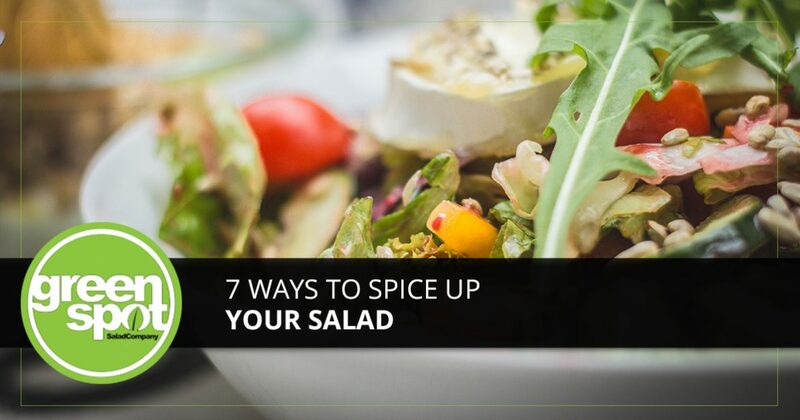 Continue reading to see our seven tips for spicing up your salad, and then come visit our salad bar to try out your ideas! This is fairly self-explanatory, but, essentially, you want to make sure that you get a good mix of arugula, spinach, endives, shredded purple cabbage, and any other greens you enjoy in your salad to add some zing. Not only will the different variations of crunchiness add variety to each bite, but the different colors of green and the various leaf shapes will add visual appeal to your meal. Visual appeal should not be underrated, because if a meal is visually unappealing, you probably won’t be tempted to take a bite. There are so many vegetables at your disposal when you consider what to add to your salad. You can find vegetables in almost every color of the rainbow, so why not provide a feast for your eyes as well as your tummy by adding a wide variety of colors to your salad? 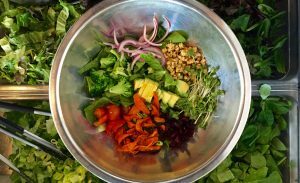 While there’s nothing wrong with a simple mixed greens salad, if you are looking for something to help spice up your next trip to the salad bar, experiment by adding in some of the colorful veggies that you might normally bypass. Part of the appeal of salads is the variation of textures within each bite. From creamy avocado to crunchy nuts and delicate lettuce, no two forkfuls are alike. If you are someone who likes to stick to what you know and are comfortable with, this might be a little harder, but push yourself to try adding some fruits, or nuts, or other textured ingredients that you have typically passed over before. 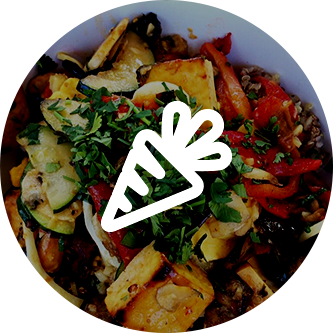 Your trips to the salad bar won’t be humdrum anymore! As we mentioned earlier, some of us know what we like, and we stick to what we like until we discover that we have become bored with our “usual” dish. Another ingredient to play around with when changing up your salad routines is the dressing. If you are typically a creamy ranch kind of person, branch out and try an oil-based dressing like Italian. You will may be pleasantly surprised by the lightness of the dressing, as well as the delicious tanginess to it. In fact, you might find that you have a new favorite dressing, and an added bonus for you is that oil-based dressings are a much healthier option than their cream-based counterparts. 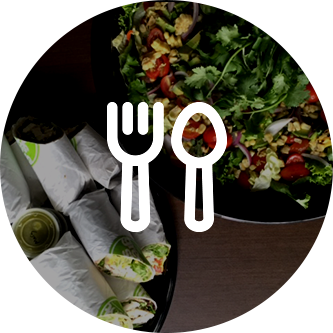 At Greenspot Salad Company in San Diego, we think that every trip to the salad bar should be one of enjoyment and nutrition. If your salad-making process has become routine, try our tips on how to change up your salad, and then visit us to make it a reality!